Spend a day enjoying the highlights of Corfu – one of the most beautiful Greek islands. 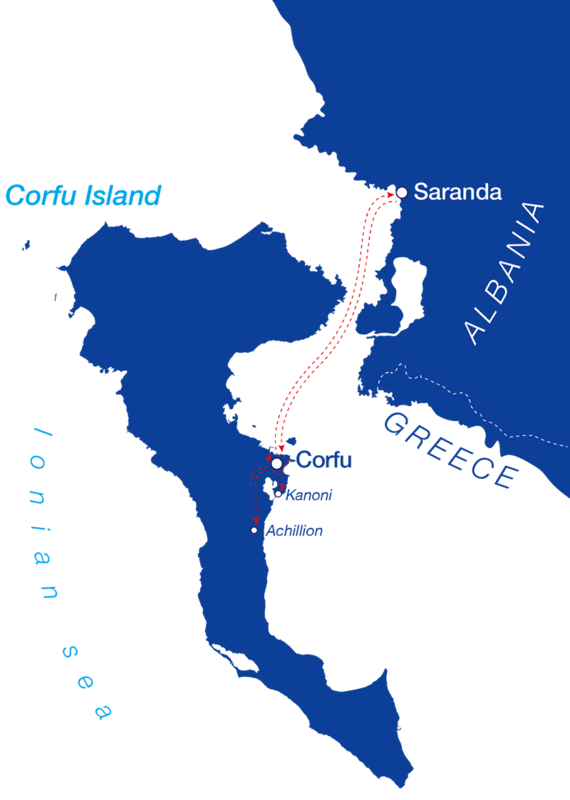 After departing from the port of Saranda, we travel along the Albanian coast until we approach the Port of Corfu. A professional guide will pick you up from the port and introduce you to the history of the island. The day begins with a visit to the Old Town of Corfu – one of Greece’s most attractive old towns, where the influence of the great civilizations remains keenly felt. Enjoy a guided tour around the Old Town centre, including Corfu’s biggest square, Spianada (known as ‘Liston’), Saint Spiridon’s church (Spiridon is the island’s patron saint), the Royal Palace, which houses the Museum of Asian Art, and both New and Old Fortresses. You will also have free time in which to stroll around the narrow streets, admiring the Venetian influence and exploring the souvenir shops. The next stop, just a couple of kilometers from the city centre, is Kanoni – so-named for the old cannon that stands on top of the hill. This lush green hill is the location of many luxurious hotels and local residences. The steps leading down from Kanoni will take you to Panagia Vlacherna church – a charming little 17th-century chapel containing an impressive wood-carved iconostasis, some beautiful frescoes, a magnificent red-tile roof, and a tall bell tower above the entrance gate. The hilltop in Kanoni gives an amazing view of the church of Vlacherna, the Ionian Sea, and the legendary Mouse Island – just a five-minute ride away on one of the many fishing boats that depart regularly from Vlacherna. The peninsula of Kanoni is probably the most photographed part of Corfu. After leaving Kanoni, we drive through Garitsa Bay – the most popular access point to the Achillion Palace. Built by the Empress Elisabeth ‘Sissi’ of Austria in 1891, the palace was later owned by Kaiser Wilhelm II of Germany. Your visit will include the museum, as well the beautiful palace gardens and their spectacular views. Corfu was Elisabeth’s favorite holiday destination. She built the palace out of admiration for Greece’s language and culture, and the architecture is intended to represent an ancient Phaeacian palace, with the mythical hero, Achilles, a central theme in its design. The Imperial Gardens provide a majestic view of Corfu’s verdant hills and valleys, with the Ionian sea shimmering in the background. When the time comes to board the ship and head back, we hope that Corfu will have won a place in your heart! 1.Our company provides coach transfers to and from the hotel and the main Port of Corfu. Departure time is subject to slight change according to local traffic conditions. Duty Free is available at the Port of Corfu. (Please pay attention to the restrictions listed at the Port of Corfu Customs Office regarding goods declaration). The cruise is subject to favourable weather conditions. In the event of the cruise being cancelled due to poor weather, you will be given the choice between an alternative date and a full refund.